This wine is made from fruit grown in the Willow Creek AVA on the West side of Paso Robles, California. 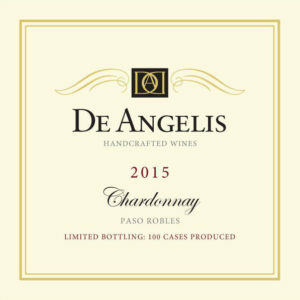 The source of fruit for this Chardonnay was very important to De Angelis Wines as we had not produced a Chardonnay in quite some time. Having now tasted this wine, we know we made the right decision, and consequently have contracted for more fruit in this same AVA for 2016. We specifically developed a lean, relatively acidic white wine that had floral notes, fruit on the nose and on the palate, and easy to drink, either alone or with various meals. To accomplish this took time effort and patience. one third of the fermented wine was racked to Hungarian oak barrels and two thirds to stainless steel. All of the wine as stirred daily for 3 months , then weekly for another three months while kept cold (57-62 degrees F.) and oxygen free. We stopped malolactic fermentation at the point where the acidity and flavors met our tasting panel criteria. After that, we racked the wine, heat and cold stabilized it, then cross flow filtered it. Bottling occurred on May 19 2015. The wine will be aged in bottle for 4-6 months before general release. In pre-release tastings thus far our Chardonnay has been described as “phenomenal”, “absolutely great” and “perfect”. We are pleased to say that we met our objectives relative to developing a limited production Chardonnay that was lean and yet elegant. This wine exhibits a floral nose, and a mineral quality on the tongue, and in the finish. When served at proper temperatures (50-55° F) floral overtones are prevalent. Its acidity and its flavor profile make it a great food friendly wine. This is a very food friendly white wine! Buy it before it is gone! This wine is made from fruit grown in the Willow Creek AVA on the West side of Paso Robles, California. The source of fruit for this Chardonnay was the same source as te gold medal Chardonnay made in 2015. The source of fruit is very important to De Angelis Wines was very important to De Angelis Wines. Having now tasted the Chardonnay made in two consecutive years from the same vineyard, we know we made the right decision. As in 2015, we wanted to develop a lean, mildly acidic white wine that had floral notes, fruit on the nose and on the palate, as well as a great mouthfeel and lingering taste experience. Best of all is it easy to drink, either alone or with meals. To accomplish this took time effort and patience. One third of the fermented wine was racked to Hungarian oak barrels, the remaining wine was aged in stainless steel. All of the wine as stirred daily for 3 months , then weekly for another three months while kept cold (57-62 degrees F.) and oxygen free. We stopped malolactic fermentation at the point where the acidity and flavors met our tasting panel criteria – about a third of the way to full malolactic fermentation. After that, we racked the wine, heat and cold stabilized it, then cross flow filtered it. Bottling occurred on May of 2016. The wine will be aged in bottle for 4-6 months before general release. In pre-release tastings thus far, this Chardonnay has been described as “phenomenal”, “absolutely great” and “perfect”. It has also been mistaken for a French style Chardonnay! We are pleased to say that we met our objectives. Th 2016 Chardonnay that was lean, fragrant and still elegant. This wine exhibits a floral nose, and a mineral quality on the tongue, and in the finish. When served at proper temperatures (50-55° F), floral overtones are prevalent. Its acidity and its flavor profile make it a great food friendly wine.